Yu Darvish's return was a messy one and the Cubs have lost four straight, so it's no surprise Chicago is an underdog as it tries to avoid a three-game sweep to the Braves at SunTrust Park. Yu Darvish's return was a messy one and the Cubs have lost four straight, so it's no surprise Darvish and Chicago are road underdogs Thursday as they try to avoid a three-game sweep to the Braves. The Cubs (1-4) are listed at +104 odds as of Thursday morning at the Westgate SuperBook for the 6:20 p.m. CT first pitch on NBC Sports Chicago (locally) and MLB Network (national). The Braves (2-3), who'll start lefty Max Fried for the first time this season, are -114, with the total set at 8.5 (UNDER -120). The Cubs let one slip away Wednesday in Atlanta as [short dogs](https://www.betchicago.com/mlb-odds-betting-cubs-braves-stats-april-3), losing [6-4](https://www.thescore.com/mlb/events/65283). Steve Cishek, Randy Rosario and Brad Brach allowed four runs combined in the bottom of the eighth on five walks and two hits, with the trio recording only two outs. Chicago's 8.83 bullpen ERA has helped keep the OVER trending in its games (now 4-0-1), and Darvish might help keep that bet a good one. He allowed three runs in only 2 2/3 innings of an 8-6 Cubs loss Saturday in Texas, giving up just two hits but walking a career-high seven in his first start since May. The Braves are also trending OVER (3-1-1), but the one UNDER came in Fried's second appearance of the season. The 25-year-old has pitched 1 2/3 innings of relief thus far, allowing only two walks. Fried, who'll be making his 10th career start, has only once gone more than 5 1/3 innings in an outing. 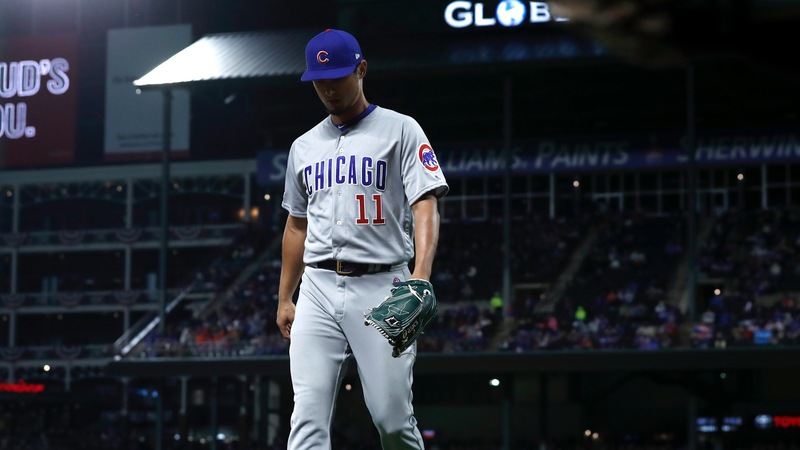 It's hard to trust Darvish until he shakes off the rust, but expect the Cubbies to play with urgency as they get ready for a big weekend showdown against the defending NL Central champion Brewers in Milwaukee. For fantasy purposes, give Braves center fielder Ender Inciarte a look. He's homered off Darvish and reached base three of the five times he's faced him. __MORE:__ [Fantasy baseball waiver wire adds/drops](https://www.betchicago.com/fantasy-baseball-waiver-wire-add-drop-mlb-opening-weekend) | [MLB first manager fired odds](https://www.betchicago.com/mlb-first-manager-fired-odds-dave-martinez-rick-renteria-joe-maddon) ## Thursday baseball odds, probable pitchers *Odds from Westgate as of Thursday morning. Check [our MLB odds page](https://www.betchicago.com/mlb-betting/odds) for updated betting lines. All times Central. **[Mariners at White Sox](https://www.betchicago.com/white-sox-home-opener-rescheduled-friday) and Padres and at Cardinals have been postponed due to rain in the Midwest. __Nats (+117) at Mets (-127), 12:10 p.m. (NYM home opener); Total: 6.5 (OVER -120)__ WSH: 2-3 NYM: 5-1 Pitching matchup: WSH Stephen Strasburg (0-0, 6.00) vs. NYM Noah Syndergaard (0-0, 6.00) Betting note: Strasburg and Syndergaard had a similar line when they met in New York's 11-8 win Saturday in Washington, as each allowed four runs and seven hits in six innings. Syndergaard struck out seven, Strasburg eight. __Royals (-105) at Tigers (-105) (DET home opener), 12:10 p.m.; Total: 8 (UNDER -120)__ KC: 2-3 DET: 4-3 Pitching matchup: KC RHP Jakob Junis (1-0, 4.76) vs. DET RHP Spencer Turnbull (0-1, 5.40) Betting note: Junis is 6-1 in his career against Detroit and 13-14 against everyone else. __Yankees (-200) at Orioles (+180), 2:05 p.m. (BAL home opener); Total: 8 (OVER -120)__ NYY: 2-4 BAL: 4-2 Pitching matchup: NYY LHP James Paxton (0-1, 1.59) vs. BAL RHP Alex Cobb (season debut) Betting note: Cobb is 7-4 with a 2.90 ERA in 17 career starts against New York. __Red Sox (-115) at A's (+105), 2:37 p.m.; Total: 8.5 (UNDER -120)__ BOS: 1-5 OAK: 5-3 Pitching matchup: BOS LHP Eduardo Rodriguez vs. OAK LHP Brett Anderson (1-0, 0.00) Betting note: Boston was 21-16 (.568) last season when facing a left-handed starter, and 87-38 (.696) against righties. __Blue Jays (+165) at Indians (-180), 5:10 p.m.; Total: 7__ TOR: 3-4 CLE: 2-3 Pitching matchup: TOR RHP Aaron Sanchez (1-0, 0.00) vs. CLE RHP Trevor Bauer (0-0, 1.29) Betting note: Bauer has quality starts in five of his last six starts dating back to last season. __Reds (+110) at Pirates (-120), 6:05 p.m.; Total: 8__ CIN: 1-4 PIT: 1-3 Pitching matchup: CIN RHP Tyler Mahle (0-0, 0.00) vs. PIT RHP Jordan Lyles (season debut) Betting note: Pittsburgh was 14-5 last season against Cincinnati, and 68-74 against everyone else. __Cubs (+104) at Braves (-114), 6:20 p.m.; Total: 8.5__ CHI: 1-4 ATL: 2-3 Pitching matchup: Darvish vs. Fried __Rangers (+137) at Angels (-147) (LAA home opener), 9:07 p.m.; Total: 8.5 (UNDER -120)__ TEX: 4-2 LAA: 1-5 Pitching matchup: TEX RHP Edinson Volquez (0-0, 9.00) vs. LAA RHP Matt Harvey (0-0, 3.00) Betting note: Texas was 6-13 last season against its division rival, including 2-7 in Los Angeles. __PLAY:__ Our [free-to-play $1,000 Chicago Baseball Northside and Southside contests](https://betchicago.chalkline.com).